San Francisco’s opinion of the transcontinental railroad was extremely ambivalent. On the one hand it was an article of faith that the city that became the terminus would enjoy prosperity unequalled. Only the solitary sobering prediction of Henry George was at odds.86 On the other hand, San Francisco’s geographic position as a deepwater port on the end of a peninsula presented a dilemma. Eager for the cornucopia of economic benefits the transcontinental connection would bring, and nervous that someone else might run off with the prize, it was considered crucial that San Francisco’s monied interests should control railroad strategy and protect the city’s future. But the most able proponent of the railroad to the Pacific was a man apparently more interested in solving the technical problems of accomplishing “the work of the age” than in his financial returns: Theodore Dehon Judah, an engineer for the Sacramento Valley Railroad—a man obsessed with a vision. Although the Pacific Railroad Convention of September 1859 was held in San Francisco, with distinguished representatives on hand from every California county, as well as Washington and Oregon, it was Judah “who pondered the problem and took into his confidence a few businessmen in Sacramento and urged the formation of a company.”87 Judah had scrambled up and down the passes of the Sierra Nevada, crossing the mountain range twenty-three times as he calculated again and again the difficult problems of building trestles around precipitous cliffs and across deep gorges, and tunneling into hard rock. So persuasive was “Crazy Judah,” with his topographic profiles of the mountain passes and his sense of urgency, that in June 1861 several small-time entrepreneurs from Sacramento got together the funds to incorporate the Central Pacific Railroad. 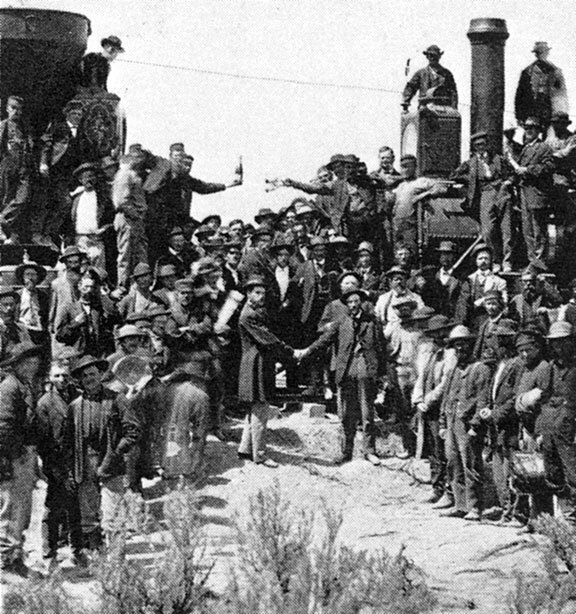 On July 2, 1862, in the dark hours of the Civil War, President Lincoln signed the Pacific Railroad Act, pressured by the fear that the western states, led by California, might form an independent union. The act was the political plum of the age. Subsidies were to be generous: $16,000 per mile for track laid in flat country and $48,000 in the mountains, plus land grants to the railroad of 6,400 acres per mile, later amended upwards to 12,800 acres for every mile of track laid. San Francisco reacted to the news with a tumultuous celebration. From Portsmouth Plaza 100 cannon fired; police, firemen and everyone else paraded—processions started early and hit every saloon in town, several times. When hangovers cleared and calm returned, a certain uneasiness took over that was reflected in the press. Lucius Beebe was probably correct when he later wrote, “What clouded the brow of San Franciscans, however, was the fact that when the great undertaking was finally inaugurated by breaking the ground in 1863, and the surveyors were driving stakes in the Sierra foothills, the moving spirits were not august representatives of Montgomery Street’s monied circles but four all but unknown and completely unimportant businessmen from the pastoral reaches of Sacramento. Leland Stanford was a grocer; Charles Crocker a drygoods merchant; and Collis P. Huntington and his partner Mark Hopkins were dealers in hardware, vendors of fuses and blasting powder and wheelbarrows.”88 How had the most important technological marvel of the times happened to fall into the hands of amateurs in the art of marrying politics to money and coming up with power? San Francisco newspapers simply could not grasp the magnitude of the situation. Calling it the “Dutch Flat Swindle,” they downgraded the real implications of “the race of the age” to a smart move on the part of a few Sacramento businessmen to build a short-line railroad to Dutch Flat and siphon off the valuable freighting profits from the Comstock mines. San Francisco had been outmaneuvered and was now in the position of being only one of a gaggle of willing, would-be brides whose fate was up to a suitor who proved to be undependable and shrewd. The most substantial hope for linking San Francisco to Sacramento lay in the San Jose and San Francisco Railroad. On February 16, 1864, the new line was complete, and in San Jose the railroad’s president, Judge Timothy Dame, announced that the Central Pacific Railroad had given both the San Jose and San Francisco Railroad and the Western Pacific the right to construct the last link in its mighty transcontinental span. Thus it would appear that San Francisco had no reason to doubt its supremacy as the port meant to be the railroad terminus. But this was not the case, mostly because of murky doings in Oakland. At this ebb in San Francisco’s hopes, the Big Four made another move to broaden their empire. The San Jose and San Francisco Railroad had extended its system to Gilroy and hoped to go over Pacheco Pass to the Colorado River to connect with the new Atlantic and Pacific Railroad that was planned to head west from the Missouri. Peter Donahue enlisted the financial backing of San Francisco’s most powerful banker, William Ralston. Together they incorporated the Southern Pacific Railroad. This move posed a real threat to the Central Pacific, whose management responded with $3.5 million and bought the San Francisco and San Jose Railroad and its planned Southern Pacific route. The next affront to San Francisco appeared in the form of a bill before Congress to deed Yerba Buena Island to the Western Pacific, from where the railroad would construct a causeway to Oakland and build warehouses and a terminal on the island. San Francisco saw this as giving away land to create another commercial city in the bay, a port to be designed and controlled by the railroads, who would then have their own wharves for shipping. Traditionally, Yerba Buena Island had been a military reservation, and federal engineers declined to go along with losing their island in the bay. They issued an opinion that such a connecting causeway would silt up the bay and diminish the tide. The outcry from San Francisco was so great that the bill was defeated in the Senate. But the idea of a railroad bridge across the bay persisted. With the exception of the Alta, San Francisco newspapers mounted a campaign, with the nervous blessing of the business community, for a railroad bridge connection directly from Oakland to San Francisco. “If the reader will take into consideration that the bay is a sort of abyss that divides the great overland railroad from San Francisco, its western terminus, after it has traversed the country over 3,000 miles. . . he will comprehend at once the necessity for spanning this gap to deliver freight and passengers to the heart of the city.”93 So wrote the editor of the Call on October 10, 1872. The San Francisco Terminus of the Central Pacific Railroad in 1878. 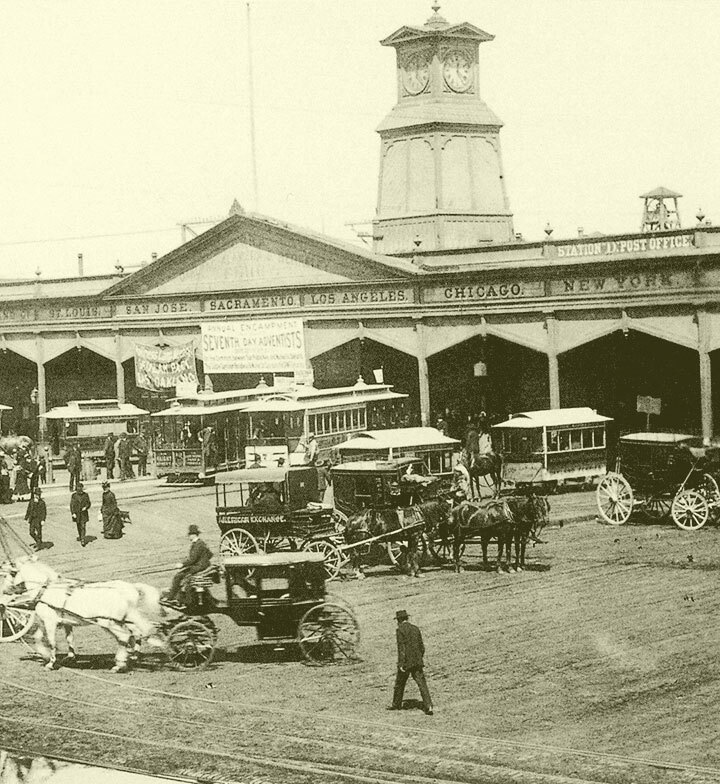 This was the new Ferry Building, completed in 1875. In addition to transcontinental passengers, thousands of workers commuted to San Francisco. From 1873 to 1877 the number of passengers increased from 2,655,671 to 5,570,555. The city fathers offered to build the railroad bridge as described at an estimated cost of $16 million; to build a harbor belt-line railway to connect all the city piers; and to fill-in the tidelands of Mission Bay to create land for right-of-way for the Central Pacific. Their only caveat was that all railroads should have equal rights to use this proposed facility. The Central Pacific countered with an offer to build the bridge and belt-line railroad themselves if San Francisco would come up with $2 million and give them the sole right to the land of Mission Bay. A compromise solution appeared to be at hand, but the Central Pacific further demanded the right to take the terminus away from San Francisco if business conditions warranted it. This was too much for Mayor W. Alvord, who vetoed the supervisors’ recommendations, and the idea of a railroad bridge died. San Francisco Beltline Railroad. In this photo taken July 6, 1938, the E-Embarcadero streetcar line is running alongside the state-owned freight line. But if San Francisco never became the land terminus for the transcontinental railroad, the Southern Pacific and Santa Fe Mission Bay freight terminals shaped the character of business in the south part of the city. The north waterfront warehouse district, built to serve the clippers of the 1860s and ’70s, was largely relocated after 1906 to the southern part of the city where Mission Bay’s important network of railroad tracks, warehouse complexes, and roundhouses also connected to the Beltline Railway leading to every wharf in the city. Unique in North America, this harbor railroad connected ships to trains after 1896 in a totally efficient cargo handling operation. 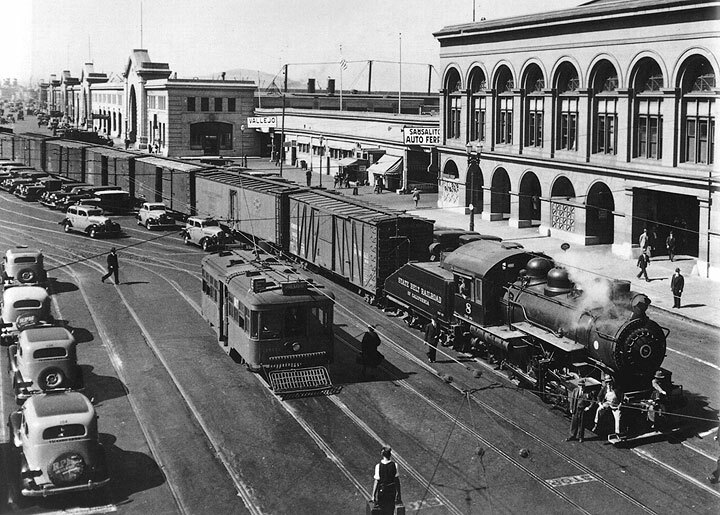 Southern Pacific’s Third and Townsend passenger depot handled a busy commuter business with comfort, speed, and efficiency remembered with nostalgia by today’s freeway victims. This is chapter ten of "Vanished Waters: A History of San Francisco's Mission Bay" published by the Mission Creek Conservancy, and republished here with their permission. 87. Bancroft, History of California, vol. 4:143-144. 88. Lucius Beebe, The Central Pacific & Southern Pacific Railroads (Berkeley: Howell-North, 1963), 19. 89. Mel Scott, The San Francisco Bay Area (Berkeley: University of California Press, 1959), 45. 90. The Oakland Waterfront Company stock included 25,000 shares belonging to H.W. Carpentier, 5,000 to John B. Felton and 20,000 shares to Leland Stanford. Bancroft, History of California, vol. 4:589. 91. J.S. Hittell, The History of the City of San Francisco. . . 374. By now the Central Pacific had bought out all its competition. As governor of California, Leland Stanford had signed several bills, passed by the legislature, favoring his own company. He could do this only in 1862-63, when it was the popular belief that the connecting railroad would be a panacea for all economic woes. Thus federal, county and city subsidies flowed to the railroads in the form of cash and land. “By 1880, the railroads had received patents to 11,458,212 acres. Approximately 16 percent of the entire land area owned by the federal government in California-land which might otherwise have been open for free settlement-was given to the railroads. As late as 1919, the Southern Pacific Company was still the chief landowner in California. 92. San Francisco Daily Evening Bulletin, June 17, 1870. 93. San Francisco Call, October 10, 1872; Carey McWilliams, California, the Great Exception (New York: A.A. Wyn, 1949), 95.